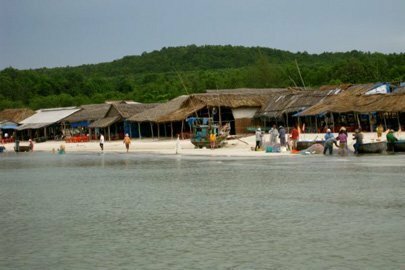 Cua Tung Bea ch is regarded as the nation’s ‘Queen of Beaches’, attracting many tourists who come to experience its beauty. Located in the coastal district of Vinh Linh in the central province of Quang Tri it is a paradise for sun worshippers. From Dong Ha City, the central hub of the province, tourists can take a motorbike on National Highway 1A for one hour in a northerly direction to reach the beach, where Ben Hai River flows smoothly into the sea. The one kilometer-long beach is not particularly long or wide, but the gentle and clear water combined with its smooth sand make it the nation’s number one. It is also surrounded by a belt of basalt and stone mountains that resemble a huge comb passing through the hair of the waves. On the hill grows green orchards of jackfruit, pineapple, banana and custard-apple. In the early 20th century, a group of ruling French imperialists discovered the beach and built many villas and guest houses in Gothic architecture to make it a relaxing resort of French officers as they occupied the nation. The palace was transferred to King Duy Tan (1900-45), the 11th king of the Nguyen Dynasty, who ascended the throne aged ten and was forced to live in confinement in his palace under the control of the French. Frenchman Andre de Laborde, who had a deep understanding of the area, described Cua Tung as a gentle sloping beach which is part of the green highlands 20m above sea level. From the slope, people can see the changes in the color of the sea and sky. The shades of blue change hourly under the sunshine, entrancing anyone who has the chance to witness nature in all its glory. Nearby Cat Son village is a short stroll along the beach. It is famous for hundreds of years of fishing and the crafts of drum-making, carpentry and mother-of-pearl inlay. To the south of the beach is the estuary of the Ben Hai River with Hien Luong Bridge just 10 kilometers from Cua Tung Beach. The bridge lies on the 17th parallel and formed the border between North and South Vietnam between 1954 and 1975. This symbol of separation and loss in wartime is now one of the links between Vinh Linh and Vinh Gio districts in the province. Boarding a boat at the base of the bridge, travelers can see lush rice paddies, bamboo and casuarinas trees along the river banks. The slow rhythm of life, the whisper of the wind and the rippling of the water, all bring about a feeling of peace. About 30 kilometers offshore from the beach is Con Co Island which was a strategic position during the American war. Lush forests and fruit trees cover the island, including hardwood with resin as red as blood. In autumn, the Malabar almond trees also turn red, making the island even more picturesque.